The last couple days have left my Instagram feed in awash in photos from the Stationery Show in New York. This annual event is THE place where all our favorite stationery and card companies unveil their latest goods and buyers from shops, big and small, place orders for the coming year. I thought I’d share a few photos but if you want to see the over 6000 images on Instagram, just search for #NSS2014. Click on images to see the original photo or post. Peek inside some stationery shops like Present + Correct in the UK. Neatography is a subscription-based paper goods company from outside Chattanooga, TN. As a former resident of Chattanooga, I was really excited to see what kinds of products Neatography would offer and to have a chance to offer support to a hometown girl. The package was wrapped in lovely grey-and-white twine with a hand-stamped tag. It felt like a delightful little present! In the package, Lindsey includes an assortment of products that value at least $25. Since the monthly subscription rate is $23 +$4 shipping, that seems more than fair. My kit included a letterpress fill-in-the-blank card from Ruff House Art; a set of fabric-covered, polka dot thumbtacks in grey and orange from Girl of All Work; an “Old School” notepad, also from Ruff House Art; a roll washi-style masking tape with arrow pattern from Side Show Press; and four US Forever stamps with the heart wax seal from this year. Neatography also includes a self-address, stamped reply postcard to send back to Lindsey with your comments about the set. I think this is one of the nicest collections I’ve received from a paper good subscription and I particularly liked the inclusion of a block of stamps. Its a very thoughtful way to make keeping in touch quick and easy. All of the products seemed to come from small, independent companies and none were products I’d seen or purchased before which was quite a treat. The notepad is lovely offset printed tablet of 50 lined sheets and I look forward to using it. I’m about to move offices at work again and I think the cloth thumbtacks will be nice on my plain office pinboards. And, seriously, who doesn’t love a roll of washi/masking tape? Its a giant roll! The Neatography subscriptions are available in a limited quantity and can be purchased as a one-time shipment, monthly or on a quarterly basis. The price is the same per shipment regardless of which option you choose. A single one-time purchase would be a great gift for a friend. Sadly, it doesn’t look as if international shipping is currently available. DISCLAIMER: This item was sent to me free of charge by Neatography for the purpose of review. Please see the About page for more details. Moglea is a tiny letterpress print shop run from a farmhouse in rural Iowa. They are creating some beautiful cards and stationery products as well as printing services and custom design and printing work. The Letterquette set was inspired by a vintage Eaton’s stationery set. The kits include notecards and envelopes. They also created a series of notepads for to do lists, grocery lists and assorted notes. Each pad is letterpress printed with artwork or an inspirational title in a casual script. Visit the Moglea shop on Etsy to purchase products. All the images are from their 2013 Lookbook. The Missing Ink Book Review (via Behind The Curtain): I’ve been meaning to read this book and have it balanced atop my precariously high to-read pile. I’ll get to it soon, I promise! The Etiquette of Letter Writing (via Letter Writers Alliance Blog): I too have a copy of this book. Fabulous albeit a little unnecessary for today’s letter writer. I do not have a yacht. Do you? Good Quality Sticky Notes (via Rhodia Drive): I was also contacted about this topic and Brad and I spoke about it briefly on the Pen Addict Podcast, Episode 54 and we are all still coming up empty-handed. Please leave a note in the comments if you have a good source for fountain pen-friendly sticky notes. Write Everyday: Morning Pages (via Rhodia Drive): I’ve mentioned Julia Cameron’s books in the past as well as a great jumping off point for writing. From my Instagram, clockwise from top left: My Cambridge leather satchel, my last order from JetPens, a handwritten note from my elderly neighbor and the drawing tools used by Brian Kesinger as spied at the Spectrum Live Art Spectacular. Check out this video for how to fold a paper note into its an envelope with the new Papier Tigre notesets. And then you can seal up your letter with some of the amazing collection of wax from the Notemaker Wax Seal Shop. Just a hodge-podge of Valentine’s Day fun, inspiration and things that are RED. Did you wait until the last minute to do anything for your Valentine this year? How about I help you out with this modern printable Valentines from Paper & Stitch? Just print these off onto cardstock, fold and trim, and put your favorite pen to work writing a special message. Add a candy bar, a bouquet of flowers or maybe a bunch brand new pencils to show your loved one you care. Binth is a shop and studio created by my friend Suzanna Bierwirth. Binth is best known for its timeless prints and poster designs for children, she is expanding her range to include stationery and home and office decor items in her Forest Park, IL shop. The video is a 3-minute piece about what inspires her to create her shop and some sneak peeks of the interior of the shop. My darling friend Annie sent me a pack of gold engraved, skull-and-crossbones note cards from the London-based stationery shop Mount Street Stationers. The envelopes are lined with glossy black paper and are perfect for my next order of rum or official decree for someone to walk the plank. Feel like dropping a quick note to a friend or loved one using a lovely stamp and those friendly folks at the post office? Then check out the downloadable templates at LetterFu that let you print out a foldable paper letter/envelope. Learn how to fold a standard letter-sized or A4 sheet into an envelope and start sending those missives! Several styles are available and LetterFu encourages you to create your own designs as well. Write on! If you work in the print design field, you’ve heard of the French Paper Company. Its one of the few independent American paper mills left and they also have a fabulous marketing team that has wisely teamed French up with designers like Charles S. Anderson to create some great packaging and products. One of those products is the French Paper Memo Books. Yeah, sure, everyone is doing these now but a pack of two of these little books is just $2.50. Inside is 32-pages of top quality French paper and sturdy cardstock covers printed with graphics from the CSA Images archive. The memo books come in pre-selected sets but there is bound to be one you’ll like. While you’re shopping, pick up some fun, reasonably-priced paper and envelopes and get a jump start on your promise to make your own Christmas cards this year. The Mod-Tone patterned paper and envelopes (shown above) sell for $30 for 50-sheets of 8.5″x11″ and the $20 for 50 A6 (4.75″ x 6.5″) envelopes. Solid papers sell for $15 per 50-sheet pack and solid A6 envelopes are $12.50 for a pack of 50. Obviously, you’ll get a better value if you buy larger quantities. For someone who loves the aesthetics and apparatus of the vintage office, the Life Japanese Stationery products will surely please. Life uses the same featherlight paper stock for their Airmail stationery that they used in 1946 when they opened their doors. They even have matching Airmail envelopes. Airmail paper pad is $12.95 AUD for 50 sheets and envelopes are $9.95 AUD for pack of 10. And no office is complete without a couple steno pads for quick notes. These three lovely pads in subdued vintage colors. The green cover is the traditional Gregg ruled, the yellow with blue lettering is ruled and the yellow with red lettering is grid paper. Each sells for $12.95 AUD. All products are currently available through Notemaker. Don’t forget to take advantage of the 10% discount at checkout by entering the code “WELLAPPDESK12” at checkout. Last week, I listed several of the paper-related subscription services. I failed to mention Nicely Noted which is a letterpress notecard subscription service. Once a month a kit arrives with three cherry-picked letterpress notecards and postage (current USPS stamps). You can purchase a monthly subscription for $18 or select a gift subscription of 2-, 3-, 6-months or a year. If you do not live in a major metropolitan area with access to independent card shops, Paper Source or the like, this would be a great way to get some small press stationery. It would also make a great gift for your favorite letter writer. Link Love: Pen and Papers and Inks, oh my! For those who love letters and the envelopes they travel in, the photographs of Andrew Bush will be pure heaven — an array of envelope shapes and sizes with unique closures and colors, new and old. A new stationery subscription service launched today called OliveBox. Each month, subscribers receive a parcel filled with paper goods. Some of the items that could be included in an Olive Box are stationery, greeting cards, art, books, magazines and home decor and lifestyle products. Each offering is curated by former Bllomingdale’s buyer, Grace Kang who is also the founder of the Pink Olive Gift Boutique in New York. Subscriptions start at $25 per month plus shipping charges but pre-purchased subscriptions for six months or a year will receive free shipping (I suspect that applies to US customers only but you may want to contact them directly to verify). Notice Life is an Australian-based office stationery company that has created a whole series of large-scale project planning and goal-mapping tools. They sent me a copy of their weekly planning pad, 2012-13 financial year wall calendar and a set of to-do sticky notes. The financial calendar is designed to align with the Australian fiscal year but as it starts in July, its more than adequate to start those long term planning goals stateside. It clocks in at a whopping 33″ x 23.5″. The months are listed across the top with the days below in long columns. In a small team or office, it would even be great to use to track time-off, holidays and other activities that effect the whole team. It could even be used as a family activity calendar. The planning pad is a substantial 11.75″ x 16.5″ with 65 heavyweight sheets glue padded on the left edge — more than enough for a whole year with a few extra for mistakes. Along the left side are spaces for tasks for Monday through Sunday, in the center is space for general to-dos, Best of Web and rewards and at the far right is a space for notes. I keep thinking it would make a great desk blotter for an individual or wall-mounted to track activities for a whole team. Since the paper seemed so sturdy, I reached straight for a Sharpie pen and a Le Pen and didn’t even get any show-through on the back. Later, I tested with a Sharpie marker and only got slight show-through on the reverse of the stock but no bleed-through. This is some quality paper! The to-do stickies have been divided up into areas to list to-do, notes, the owner of the task and the finish date. Its A7-sized, about 2.75″ x 4.25″ and has 50 heavyweight paper sheets. The whole line of Notice Life products are available through our esteemed sponsor, Notemaker. If you order any of these products, you can receive a 10% discount when you enter the code WELLAPPDESK at checkout. If you would like to win this Notice Life office collection (the planning pad is less one sheet used to test pens), please leave a note in the comments. FINE PRINT: All entries must be submitted by 10pm CST on Monday, August 27, 2012. All entries must be submitted at wellappointeddesk.com, not Twitter, Tumblr or Facebook, okay? Winner will be announced on Tuesday. Winner will be select by random number generator from entries that played by the rules (see above). Please include your email address in the comment form so that I can contact you if you win. I will not save email addresses or sell them to anyone — pinky swear. Shipping via USPS first class is covered. Additional shipping options or insurance will have to be paid by the winner. We are generous but we’re not made of money. Having just returned from a three-week trip abroad to Hong Kong and China, I thought I might reveal a few of my own tips (both things I wish I had packed and things I’m glad I packed) from my experiences. If you’re traveling in Asia, or anywhere really, pack a few packages of travel-sized tissues. In Asia particularly, many restrooms do not have paper of any kind so you really need to pack your own. Some restaurants even charge a fee for napkins or tissues in an effort to be more “green”. The theory being that if you have to pay for napkins, you won’t use as many. Right. A small backpack can be the perfect overnight bag. If you are making a day or two jaunt away from your hotel of choice, you can leave your larger suitcase behind with the concierge and take the small pack. I used a pack as my “plus one” on the plane to carry and extra sweater and my can’t-live-without toiletries in case my luggage went astray. On days when you are out shopping, a backpack can be a great carrier for purchases and maps and such. Just remember not to put your passport or any valuables in your pack in case someone gets wily and tries to pickpocket you. If you plan on packing an extra pair of shoes, choose a pair you wouldn’t mind losing if you need to free up space in your luggage on the return trip. I dumped a bulky, old pair of shoes in order to make more space for items I collected on my trip. As much as you may want to take advantage of the convenience of pre-packaged, travel-sized bottles of toiletries, be careful. I switched brands of lotion and facial cleanser and halfway through the trip suffered from major skin irritation that lead me to wander desperately through the aisles of a Hong Kong drug store in search of a more gentle replacement. Don’t switch horses mid-race. Trust me on this, I looked like I’d run into a belt sander with my face for a whole week. Many nice hotels (at least all the hotels I stayed at in China and Hong Kong) stock the desk with paper, envelopes and even postcards. If you’re in a really nice place, they may even stock the desk with an array of office supplies. Don’t steal shampoo. Steal office supplies. Or put them to good use and write to friends and family back home.If you are away from your home country, ask the concierge to mail your letters for you. Finally, I got out in Hong Kong and got to do a little shopping. Needless to say, my first stop was the humongous shopping area in Kowloon called Harbour City. Inside was a large Muji shop and the notorious CitySuper (notorious to me since I stalk Patrick of Scription fame). Both were totally worth the hype and I’ll have several follow-up reviews of individual products, not to mention a plan to visit both of them again before I head back to the States. Most people are already familiar with the minimalist-designed Japanese design store Muji. They sell all sorts of products for life and home including lots of inexpensive, simply designed office products. I purchased a few of their gel and roller ball pens, notebooks, stationery sets and their 3-pack of washi tape in brown, grey and tan and a gorgeously Japanese tape dispenser for only a couple dollars US. CitySuper is a large scale international grocery store with kitchenware, liquor, stationery and gift products. If you are an American and European ex-pat in Hong Kong, you will want to know about CitySuper. I had to see the assortment of stationery products and I was not disappointed. I bought a camera charm for my Pelle though I may go back for a Midori Travelers Notebook just because I love that I can just walk in and buy it, not order it or wait for it to ship. I found a wide elastic to wrap around an A5 sized notebook with a leather divder three writing tools. I found a Faber-Castell Perfect Pencil with built-in sharpener and cap as well as replacement pencils, each under $5US. I also stocked up on Pilot Hi-Tec C Coleto refills, because I could. I also went a few blocks over to the mall that had the CitySuper LOG-ON shop which was similar to the CitySuper at Harbour City but with more statonery, photo and personal goods and a lot less food product. I hope to go back and browse next weekend when I have a bit more time. My last stationery find was a little office supply shop along the street that was catering more to local shops and office workers and less to the tourist trade. They had a large spinner of self-inking stamps for about $3US each that said things like “RECEIVED” with the corresponding Chinese translation as well. Do you think I need one? There will be more in-depth reviews and descriptions in the future when I get back to the States but I didn’t want any of my fine readers to think I’d been slacking on my hunt for office goodies, worldwide. Packed into a wooden cigar box, the Forgetful Gentleman Correspondence System is a set of understated, classy notecards for the dignified man. The box contains 12 letterpress cards with envelopes including birthday, thank you, congratulations, love and blank to cover a full year’s worth of sending situations. There is even a booklet included to help you properly word your sentiment. Forgetful Gentleman also offers a less expensive linen correspondence set packed into a paperboard cigar box and filled with 12 offset cards and the writing guide. Because, yes, even men need to send cards. $75 for the letterpress set, $25 for the linen set. I just love this quote about letter-writing from Lord Byron found on Orange Art Store. 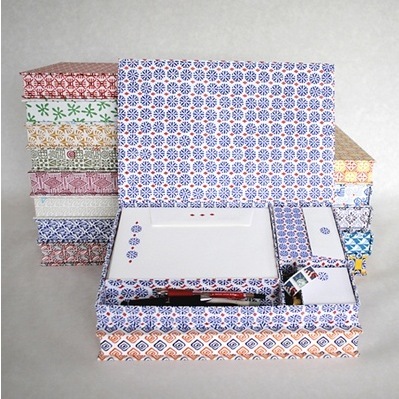 I wandered over to their site when I heard they stock correspondence box sets in beautiful presentation boxes. Each set includes a selection of letterpress printed notecards, envelopes and writing paper. The set is a bit pricey at $75 but would make a lovely gift for the letter-writer in your life. For the more budget conscious, they also offer a writing paper set with 15 letterpress printed sheets and 10 envelopes for $18.95 or folded note cards set with 8 letterpress printed note cards and envelopes for $14.95. Over a dozen patterns are available. This is a lovely audio story about how pencils and paper still make an impact on people. What would take to a desert island? Pencil and paper, of course. Favorite items in your “dream pencil case”? Hear more by listening to the story on the BBC.